Another milestone today I as drink beer #200. Hooray for me…even the birds are chirping as I sit outside typing this. 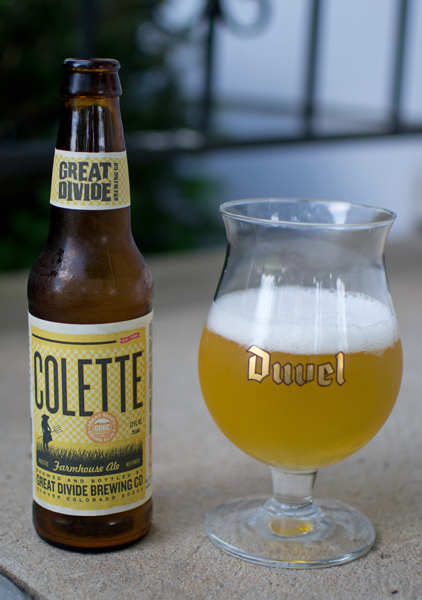 I continue on this mad journey to #365 in pursuit of great beer…of which I have had quite a few. So many excellent beers (some clunkers too) I have had the pleasure of trying make this effort worthwhile. Out came the New York Yankees (nice win for them this afternoon sweeping the Texas Rangers) glass for this. It poured a nice clear amber with a thin white head. The nose was caramel malts with a slight nutty aroma coupled with pine and citrus, lemon and grapefruit, and a grassy like smell. Smelled really nice that I was hoping it would taste as good as it smelled. 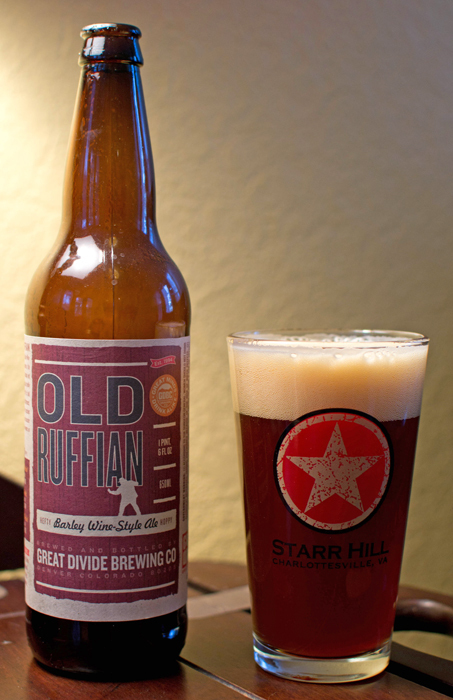 And it did…with the hops up front (lots of pine and grapefruit) followed by the slighty sweet caramel malts. It had a nice bitterness to it that hung around long after it went down my throat. It had a body bordering on heavy being sticky and syrupy. The carbonation was moderate making this fairly smooth. The alcohol was hidden really well for the high ABV. Overall, it was right up my alley. A delicious way to celebrate beer #200. As a bonus, I had the pleasure to watch two deer wander through my back yard as I was finishing this beer…good times! Cheers and on to the next 165 beers! As the days roll on and my basement gets more and more cluttered with all of the bottles from the past 154 beers…I begin to doubt once again if I will finish this little endeavour. Not that I can’t finish it…I just wonder if I really want to. Oh well…to that end…on to another beer. 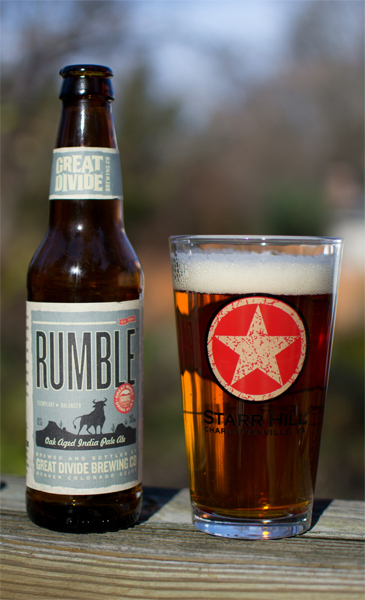 Beer #155 comes to me from Colorado by the way of Great Divide Brewing Company. 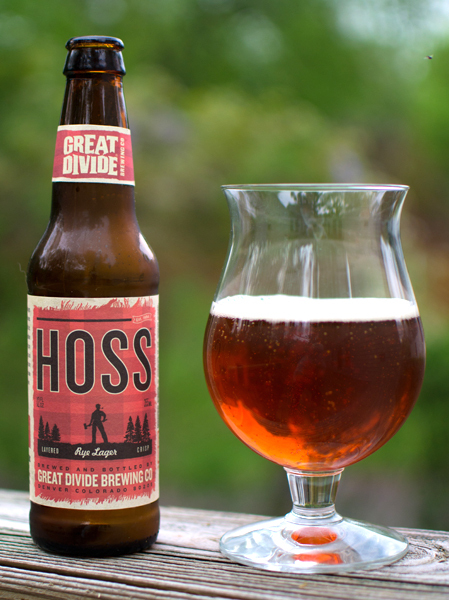 Hoss (odd name) is a Marzen or an Oktoberfest with an ABV of 6.2%. According to the bottle it was bottled on February 4th of 2011…pretty fresh stuff. This was a pretty beer, a nice dark orange color. Either my nose is busted or this was pretty mild in the aroma department. I did get some caramel like malts…but that was it. I didn’t get any rye and considering it mentions rye lager on the bottle, I thought this was odd. Sure enough…the taste was straight up malt. There was something here also slightly sweet, almost fruity but damned if I knew what it was. Mouthfeel was typical, medium body with decent carbonation. I could see one drinking these with ease. Ehh…nothing here to write home about. Average, average, average…did I mention it was an average beer? Another NFL weekend with a full slate of games on Saturday and Sunday means the TV will be pegged on CBS and FOX. That also means some beer drinking will happen during the viewing of those games along with some junk food eating…yum! 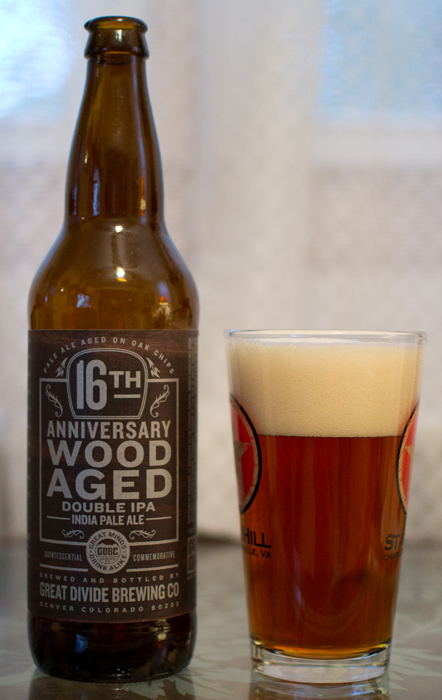 Beer #48 is 16th Anniversary Wood Aged Double IPA by Great Divide Brewing Company. 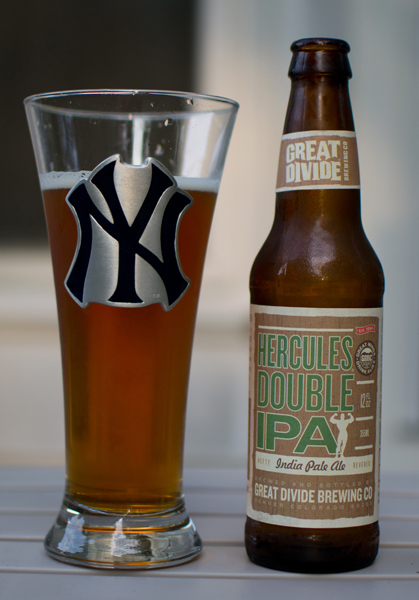 This brew is an American Double IPA or an Imperial IPA. The ABV on this beer is 10% which means, to me at least, a sipping beer. I’m looking forward to this being the hophead I am. It poured a beautiful clear amber with a very big head that quickly dissipated. There was some excellent lacing that remained throughout the whole pint. Grapefruit and pine make up the majority of the nose but much milder than I was expecting for a Double IPA. There was also a bit of a bready malty aroma hanging around. Up front in the taste was that familiar citrus grapefruit hop flavor and it finished with a smoky smoothness. I would assume that is from the oak this was aged with. This was super smooth with a medium body. There was none of that really hoppy bite I was expecting from a Double IPA, which I really love. The alcohol was hidden really well, coupled with the smoothness, made this quite an easy drinker. A very nice beer indeed, though I’m not sure I would consider this a Double IPA. Although saying that, I wouldn’t pass this up if I was offered it again. It just wasn’t as hoppy as I like. I wonder if the oak aging had anything to do with that? December 7th, “a day that will live in infamy”. As you may well know today is the 69th anniversary of the Japanese attack on Pearl Harbor that occurred back in 1941. National Geographic has an informative site on the attack. Here is a link to the site, http://www.nationalgeographic.com/pearlharbor/. Cheers to “The Greatest Generation”. I, for one, am grateful to those who served in the past and for those who currently serve. 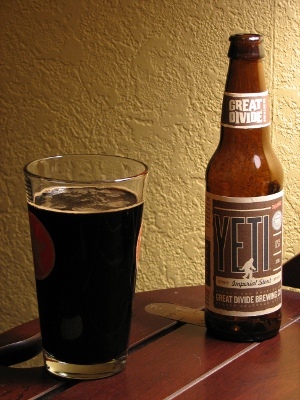 Beer #9 is a Russian Imperial Stout by Great Divide Brewing Company…let me introduce the Yeti. Weighing in with an ABV of 9.5% and 75 IBU’s, this Yeti is not one to be toyed with lightly. This pours a “simple, beautiful, classic” black (“none more black”). A few Spinal Tap references there which if you haven’t seen…shame on you. I took my flashlight app on my Droid and held it behind the glass, no light shown through. The head is tiny with a nice tan color to it. The aroma is so good, dark chocolate, strong coffee, something slightly sweet, possibly toffee, and slightly hoppy. Taste is dark chocolate and coffee up front with a hoppy, dry finish. Delicious! Mouthfeel is thick and syrupy with some decent carbonation. It would be really easy to drink a few of these but be warned, the 9.5% ABV will knock you for a loop. I like this quite a bit. The smell, the taste, the hops…yum!! !